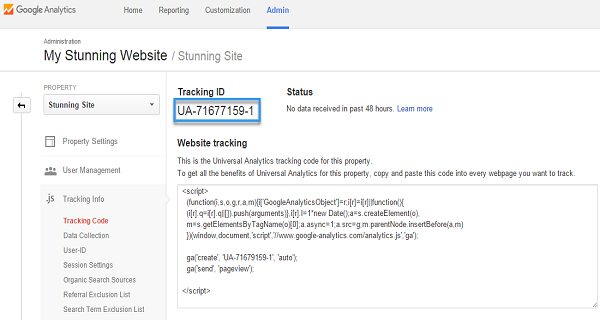 Are you looking to setup Google Analytics for your photography site? If you’re a professional photographer, you’re probably always wondering how you can get more clients to come your way. The simple answer is that you need more consultations. Of course, to get those consultations, you need more people on your website. To bring more people to your website, you need better social media and SEO. It all sounds incredibly complicated, doesn’t it? The good news? It’s not as tough as you’d think. In fact, all you really need is to know who’s coming to your website in the first place. When you track your visitors, you can begin to understand what you need to do to not only attract more traffic but convert that traffic into paying leads. So how do you track everything? Easy. All you need is Google Analytics. Set up your account using your URL and account name: If you only have the one site, you should be able to use the same name in both places. However, if you have two photography websites (maybe one for weddings, and one for landscapes) you might need to choose two account names. Fill in your time zone and industry category: This might not matter as much to you as the other elements of your Google analytics, but it’s nice to know where your visitors are coming from, and when they visit your page. Choose your data sharing settings: To protect yourself you might want to uncheck all the “sharing” settings on Google analytics. There’s a good chance you won’t need them, to begin with anyway. If you can’t find this section in the “Settings” of your WordPress theme, don’t worry, there are plenty of Plugins out there that can help you to add your code easily too. Ultimately, the aim of Google Analytics is to help you find out what’s working for your website, and what isn’t. All you need to do to start tracking is head over to your “Channels” and look at “All Traffic” on the Acquisitions Report. That page gives you some basic information to help you figure out what’s going on with your website, but it might not help much if you’re trying to achieve specific goals with your content. A better way to make sure that you’re getting the best results when you’re setting up Google Analytics is to establish a “filtered” view. When you look at your analytics, you’ll automatically see all information about your website traffic in one complicated blob. However, you can select specific metrics to filter your results a little bit. For instance, you can look at things like average duration of visit, and percentage of new visits each month. Google analytics even helps you to set up “Goals” that track a specific selection of metrics on each of your photography websites. Your goal will help you to track how you’re performing in particular areas when it comes to developing your photography website. The more information you track after setting up Google analytics, the easier it will be to improve your online presence. However, it’s worth making sure that you don’t overdo it when you’re just getting started. Here are a handful of metrics to keep in mind to start out. Although your photography website is likely to be a lot more about images than written content, that doesn’t mean that you shouldn’t pay attention to the words you use. Photographers need to carefully monitor how much traffic they’re getting from specific keywords. Remember, SEO is important to every business – no matter what it might sell. Finding out which phrases perform best, how each page ranks on your site, and more can be pivotal to your online presence. It also helps you to know where you should focus your SEO attention. You’ll find your keyword traffic in your “Traffic Sources” page, under search and “Keywords”. It’s important to know exactly where on your site your potential clients spend most of their time. There’s a good chance that most of their interest will be focused on your portfolio. However, if they’re all looking at an old blog post, then you might want to ask yourself what makes that content so appealing. If wedding photos get more views than your landscapes, maybe it’s time to focus your niche a little more. Using the “Pages” report on Google analytics will help you to find your best-performing pages and hopefully make the most out of them, too. How do you make the most out of your Google Analytics experience? Did you find setting up your system easy? 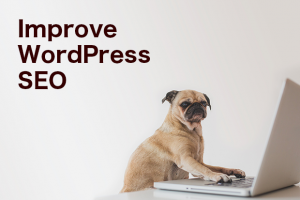 Let us know in the comments below, or follow us on Facebook and Twitter for more useful WordPress content.